Writing pharmaceutical regulations into international trade deals can have costly consequences. Cesar Alva at his home in Lima, Peru, in July. Alva was diagnosed with HIV in 2001 and is currently taking atazanavir, a second-line HIV drug, for which the Peruvian government paid $10 per pill in 2014. I first met Cesar Alva on a gray winter afternoon in downtown Lima. He wore a knit stocking cap over a thick head of hair, drawing attention to his slight underbite and jaundiced eyes. Alva lives with his parents, a retired housekeeper and construction worker, in a neighborhood at the center of Peru’s swelling capital city. He is HIV-positive. He’s not sure how, or when, he got the virus, but after he was diagnosed in 2001, his parents spent most of their tiny pension taking him to doctors and buying him medicines on the black market. That first year, Alva was hospitalized for several weeks during a particularly sick period. After he was discharged, he learned that he’d contracted tuberculosis in the hospital; in the years that followed, he got TB again, as well as toxoplasmosis, a parasitic infection, in his brain. Both diseases commonly strike the compromised immune systems of people with HIV, and they came with high price tags for treatment, costs Alva’s family had to cover. He couldn’t afford to take antiretroviral treatment regularly, and he says a doctor told him his immune system defenses were way too low. “There’s not much left we can do,” he remembers the doctor saying. Atazanavir is at the center of a pharmaceutical patent controversy bubbling in the Andean nation. The Peruvian government paid about $10 USD per pill for atazanavir last year, more than most other countries in Latin America — about twice what Mexico paid and 20 times what neighboring Bolivia paid — according to RedGE, a network of Peruvian organizations that work on human rights and development issues in international relations. Although an estimated 65,000 Peruvians had HIV in 2014, and just more than 1,700 took atazanavir, the country spent $8.4 million USD on the drug, more than half its total spending for antiretrovirals. Atazanavir is patented by Bristol Myers-Squibb, an international pharmaceutical company, which has exclusive rights to sell the drug in Peru through 2018. So the drug costs whatever the company decides to charge. RedGE wants the government to override the patent, through a legal provision written into international trade agreements, so that generic versions of the drug can be sold in Peru. So far the government has been largely silent on the request, with ministers reportedly disagreeing on whether to go forward. Although it eats up the antiretroviral budget, atazanavir is hardly the most expensive drug Peru buys. The country faces a growing problem with high-cost brand-name drugs, and RedGE and other patient advocates say that problem could soon get a lot worse, after Peru recently agreed to further limit competition on pharmaceuticals as part of the country’s biggest trade deal in decades, the Trans-Pacific Partnership (TPP). Organizations around the world say that provisions included in the deal’s chapter on intellectual property will further restrict Peru’s and the other member nations’ ability to buy cheaper versions of some of the costliest medicines — and limit their access to new types of drugs. The 12 countries2 involved in the deal, which collectively make up 40 percent of the world’s economy, came to a tentative agreement this month. Although Peru is expected to ratify the agreement, as are most of the other member countries, it’s not so clear whether it will pass in the United States.3 Democratic presidential candidate Hillary Clinton, once a supporter of the TPP, recently came out against the deal, singling out the provisions on pharmaceuticals as one main reason for her opposition, and many legislators have expressed concern as well. But Congress has already agreed to hold a simple yes-or-no vote, meaning that when the deal comes up early next year, members won’t be able to make amendments. 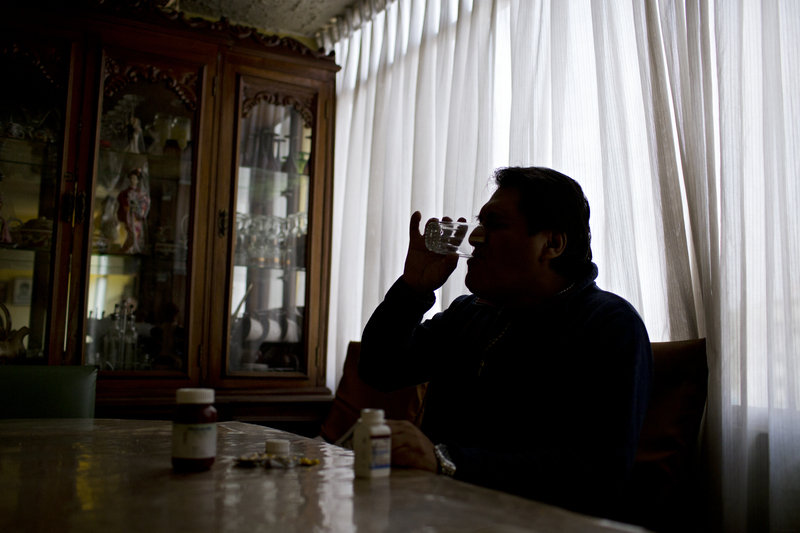 Cesar Alva at his home in Lima, Peru, taking his antiretroviral treatment. In the final days of September, negotiators and trade ministers from the dozen TPP countries took over several floors of an overly air-conditioned luxury hotel in downtown Atlanta, hoping to finally come to an agreement after five years of talks. In the lobby, nongovernmental organization staff members and representatives from industry groups hunkered down next to journalists, awaiting news from the secret negotiations upstairs. Just a few sticking points remained, though these few would make or break the deal. One issue was the talk of the lobby, and a spokesperson for the U.S. Trade Representative said it would likely be the last piece of the agreement resolved: the period of monopoly that member nations would grant to the next frontier of pharmaceuticals, known as biologics. Biologics are medicines made from living, natural resources, as opposed to the chemical synthesis used to create most traditional pharmaceuticals. While the category includes some older treatments and vaccines, relatively recent advancements with monoclonal antibodies, which can bind to specific defects in a cell, combined with high prices have led many within and outside of the pharmaceutical industry to believe that biologics are the future of treatment for cancer and other chronic diseases. They offer huge opportunity for treatment, but are also incredibly expensive; biologics were averaging 22 times the cost of traditional pharmaceuticals back in 2008. Because biologics are relatively new to the market (and complicated to make), there’s very little competition — yet. A little more than a dozen “biosimilars,” akin to generics for traditional pharmaceuticals, have been approved in Europe, and the first, a cancer drug called Zarxio, was approved in the U.S. this year. The final controversy in the TPP discussions was over how long countries should prevent biosimilars from entering the market after a biologic is approved. In the U.S., pharmaceuticals are shielded from competition through patents and other regulation. All countries in the TPP already provide 20 years of patent protection for traditional pharmaceuticals through previous international agreements. But in the U.S., biologics are also granted a monopoly for 12 years after they receive marketing approval, whether they have an active patent or not. Pharmaceutical companies say this is necessary to promote innovation (though the Federal Trade Commission disagrees and says it will likely hurt consumers), and the U.S. pushed hard for these same terms in the TPP. The issue wasn’t the number of years this exclusivity should last, but whether biologics should get these protections at all. Few are happy with the deal negotiators reached in Atlanta: Pharmaceutical companies are disappointed the TPP grants only five to eight years of exclusivity. Activists wish it didn’t grant any at all. One of those activists is James Love, who has worked on access to medicine for more than two decades. His organization, Knowledge Ecology International, won a MacArthur Foundation “genius” grant for years of work on intellectual property policy. “It’s a shame. The biologic thing has sucked the air out of the room on the TPP,” Love told me recently, launching into a monologue about the many provisions of the deal he opposes. His underlying concern on all these provisions is that they give longer monopoly periods to an increasing number of pharmaceuticals. Love sometimes begins presentations on intellectual property with a graph of basic monopoly pricing theory that can be found in just about any economics textbook. There’s a section labeled “deadweight loss” that represents people who want to buy a product but can’t afford it. In health care, Love says, that section represents dead people who didn’t get the medicine they needed, because if a drug is too expensive, then a country doesn’t buy it or an insurance company doesn’t cover it. “We’re sick of patients being held hostage over prices,” a natural consequence of granting monopolies that prevent generics from entering the market, he says. The TPP will not only keep drug prices high, Love contends, but also bind the U.S. and other countries to a patent system in desperate need of an overhaul. Pharmaceutical companies say these periods without competition promote innovation, and correctly point out that the majority of drug development happens in places like the U.S. and Europe, which have strong protections and clear rewards. Critics recite the statistical adage that correlation does not equal causation, saying the toughest laws exist where companies can apply pressure to implement them. Growing evidence suggests that while patents do encourage innovation, they do it in an inefficient way. I’ve spent the last couple of months reading through the literature on whether patents do encourage or cause innovation, and whether including regulations on pharmaceuticals in trade deals has benefited countries in the past. Unsurprisingly, there’s a study to back up whatever you want to believe on these subjects. And though some are of higher quality than others, they all share essential flaws, largely because it’s really hard to control for the ever-shifting geopolitical climate that shapes where, and how, pharmaceutical patent law and regulation are implemented. As Yi Qian, a professor at the University of British Columbia who studies the effect of trade policy on innovation, told me, “economists aren’t dictators,” which makes it nearly impossible to run randomized control trials on most public policy, including patent law. Still, across these studies, several themes emerge (this review of the evidence summarizes them well): Pharmaceutical patents do fuel innovation, but at a very high price. The cost of medicine is going up and the rate of return (in the form of innovation) is going down. In recent decades, the majority of new drugs brought to market have been of little real therapeutic benefit. But granting patents and monopolies is the only financial rewards system for innovation that’s really been tested, making it impossible to say whether it works better than the alternatives. And finally, a point that is key for countries like Peru: The benefits of patent protection for pharmaceuticals are mainly for wealthy countries — poor people in poor places bear the brunt of the system’s inefficiencies. It’s hard to imagine rolling back pharmaceutical monopolies in the U.S. and Europe (especially given how strong the industry’s lobby is), but lots of people are talking about it. The Economist magazine recently outlined the evidence against patents and drug monopolies, calling for an end to the system. In September, the Council of Europe passed a resolution asking member states and the World Health Organization to “put forward alternatives to the current patent-based pharmaceutical innovation model.” Democratic presidential candidates are including alternatives in their campaign platforms. Most people in the U.S. think that drug costs are unreasonable and that pharmaceutical companies are to blame. There’s also evidence that a complex web of regulation, like the one in the U.S. that is increasingly being promoted in trade agreements like the TPP, creates opportunities for the pharmaceutical industry to win longer monopolies. Robin Feldman, a professor at the University of California, Hastings College of the Law, has researched patent law extensively and recently published a study showing how regulations intended to promote generic medicines in the U.S. have been manipulated by the pharmaceutical industry, so that brand-name drugs get a longer monopoly than intended, at a cost of many billions of dollars for the government and consumers. 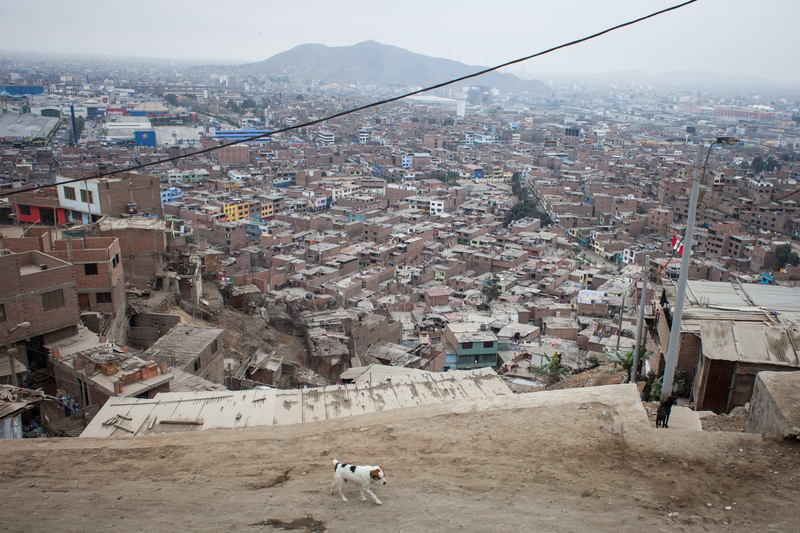 About a third of Peru’s 30 million residents live in the capital, Lima. The majority of the country’s HIV cases are concentrated here. Correa was a delegate to previous trade negotiations for Argentina, has served on boards for the World Health Organization, and currently works with the South Centre as an adviser on intellectual property for developing countries. He has also consulted with the Peruvian government on the legal workaround that advocacy groups have requested for the patent on atazanavir. The World Trade Organization has made it very clear that individual countries can decide when to allow this exception, Correa pointed out, but its use is frequently contested. It has put drugs that would otherwise be unaffordable in the hands of millions of people, but countries including South Africa, India and Thailand have been penalized for implementing it. Peru isn’t the only Latin American country that granted a patent to atazanavir (though some, like Colombia, did not). Some pay less because they have better negotiating power (like Brazil, which has more than 10 times the number of people living with HIV as Peru). Others buy the drug through an international agreement that lets low-income countries buy generic versions of HIV treatments. Bolivia, along with at least 110 other low-income countries, buys atazanavir this way. Peru, which has a per capita GDP of about $6,600, is considered an upper-middle-income economy by the World Bank, and has not been allowed into that agreement. In response to calls to work around the patent in Peru, Bristol Myers-Squibb reportedly dropped the price of atazanavir by 35 percent this year, but the country still pays more than its neighbors for the drug. Bristol Myers-Squibb and ALAFARPE, Peru’s leading pharmaceutical industry group, did not respond to requests for comment. All this controversy in Peru is over a drug that is crucial for people like Alva but probably won’t be recommended for long. Treatments in middle- and low-income countries are often a couple of generations behind those in the U.S., which has already moved away from treating HIV with atazanavir. The battle over using generic drugs to treat HIV will likely continue long after the atazanavir patent in Peru has expired. And if the TPP is ratified, many more drugs and diseases could become part of that fight. Peru already spends a huge amount on biologics. In 2014, the country’s public health insurance program spent about $266 million USD on pharmaceutical drugs. About 17 percent of that money went to just 12 biologics, according to an analysis by the Peruvian newspaper La Republica. Nearly $10 million was for one drug, herceptin, used to treat breast cancer, and was the most paid for any single medication. The paper, La Republica, also got its hands on a study commissioned by Peru’s Ministry of Health, which found that five years of exclusivity on biologics, the terms in the TPP, would equal a 17 percent increase in the cost of biologics for consumers compared to what the country would spend without it. Five years of exclusivity on biologics, the terms in the TPP, would equal a 17 percent increase in the cost of biologics for consumers. His point wasn’t just a philosophical or moral one. In Peru, like many countries, citizens have a constitutional right to health. Among other things, this right manifests as a list of treatments for diseases that are covered by the government, particularly for people like Cesar Alva who don’t have the means to pay for that care themselves. It’s a fundamentally different approach to medical care than the U.S. takes, though it’s an approach that is shared with most of the world. This helps explain why domestic laws on intellectual property often differ substantially from regulations sought by the U.S. in international trade agreements like the TPP. 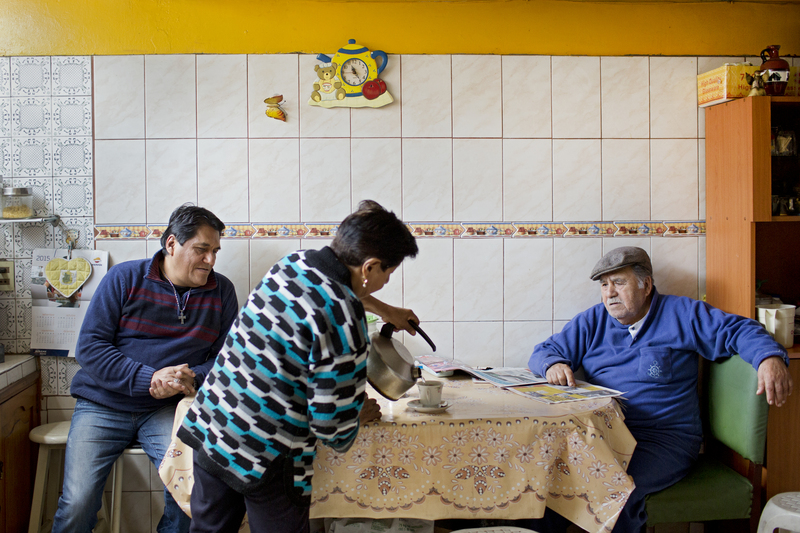 Cesar Alva at the home he shares with his parents in Lima, Peru. International trade agreements are legally binding, meaning the countries that sign on must bring their domestic laws in line with the agreed-upon provisions, and they can’t change their laws without also amending the deal. That’s part of what has so many people frustrated with the TPP: It restricts the ability to innovate the patent system itself. For years, Love, who wants to overhaul the patent system, and many others have offered ideas for alternative rewards systems for drug innovation. The most common proposals involve using public agencies to fund research and development so that discoveries won’t have to be patented. Another suggests using public prizes to award patents rather than granting a temporary monopoly on sales. Love has come up with successful alternatives before: He was behind the Medicine Patent Pool, the agreement that lets Bolivia buy atazanavir at a fraction of the price Peru pays. Changing the existing patent and regulatory system for pharmaceuticals would also change the industry’s profit structure. I interviewed many industry executives for this story who refused to go on the record, and I put in requests for interviews with more than a dozen government and industry groups who either declined or didn’t respond. It’s easy to understand why: Even though the need for profits and rewards is real, arguing for them while activists warn that people might die is unlikely to win anyone popular support. Activists and industry staff alike did agree on one thing: We need innovation in pharmaceuticals, and people need access to medicine when we develop it. A multibillion-dollar industry relies on the system we have, and we shouldn’t expect that industry to offer up alternatives or easily accept them. No one questions whether innovations should be rewarded, the question is how, and who should pay the bill. Anna Maria Barry-Jester reported from Peru on a fellowship from the International Reporting Project (IRP). CORRECTION (Oct. 19, 3:28 p.m.): An earlier version of this article included an incorrect graph to illustrate monopoly pricing theory. We have replaced the graph. CORRECTION (Oct. 19, 5:23 p.m.): An earlier version of this article gave an incorrect figure for the percentage of pharmaceutical spending in Peru last year on 12 biologic drugs. It was 17 percent of spending by the country’s public health insurance program, not 65 percent. This interview with Alva, as well as all other conversations in Peru, was conducted in Spanish. I later translated the interviews to English. Australia, New Zealand, Japan, Malaysia, Singapore, Brunei, Vietnam, Mexico, Peru, Chile, Canada and the United States. All 12 countries must ratify the deal for it to become law.